Lord William Cavendish-Bentinck was the 6th Duke of Portland and was a conservative British politician. 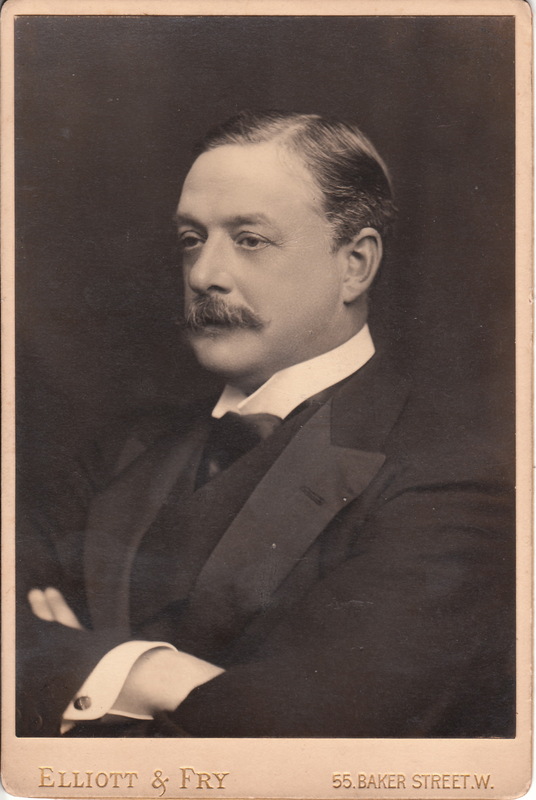 He held office as Master of the Horse under Lord Salisbury (1886-1892 and 1895-1902) and under Arthur Balfour (1902-1905). From 1898 until 1939 he served as Lord Lieutenant of Nottinghamshire. At the coronation of King George VI he carried the crown of Queen Elizabeth. He was also known for owing a stable of Thoroughbred race horses which included some well known and successful horses. The photographic studio that produced this Cabinet Card is Elliott & Fry of London, England. This Victorian photographic studio and photographic film manufacturer was founded in 1863 by Joseph John Elliott and Clarence Edmund Fry. For an entire century the studio took and published images of leading Victorian luminaries from the fields of science, public service, art, politics as well as celebrities of the day. Famous Edwardian photographer working for the studio included Francis Henry Hart and Alfred James Philpott. Most of the early negatives from this studio were destroyed in the bombing of London during World War II. The surviving negatives are held by Great Britain’s National Portrait Gallery.